Have an iPhone or an iPod touch? Need a tuner? 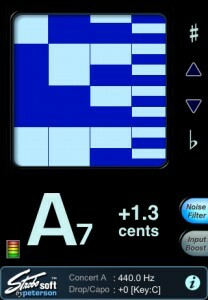 You NEED the Peterson Strobe Tuner for the iPhone/iPod Touch. I’ve tried many of the tuners available that are available for the iPhone/iTouch, free and paid. This one is worth the $10. If you don’t know what a strobe tuner is, check out this wikipedia entry. I have had a Peterson Virtual Strobe tuner since 2001. It is annoying accurate, but not really something you can take out on a gig. It is large. And stuffing it into your gig bag isn’t really an option. I have mine mounted on my stand in my studio. Back to the iTouch/iPhone version. Putting the two on a stand together, and trying to tune, both strobe tuners pretty much work the same. You try to get it to stop moving. The hardware version is a little more smooth in its motions, and iTouch/iPhone version is a tad jerky, but not really anything to complain about. In fact, the iTouch/iPhone version didn’t get confused as to what note I was playing. The hardware Strobe tuner sometimes things I’m tuning to an F when I’m really doing a concert D. I’ll see about making a little video showing them in action. Bottom line. If you have an iTouch (second Generation) or an iPhone, the Strobe Tuner is well worth it. 10 out of 10. I’d say it is perfect.